I’ve done the same this year and I want to share my word/themes with you. For me, and I think for many of us, online security will be an important theme this year. In fact, all kinds of security – political, financial, as well as technological – seem to be in the forefront of my mind. I will strive to increase my knowledge of online security practices and ensure I am doing everything I can to secure my online life, while helping others to do the same. Building and maintaining effective digital platforms is emerging as a guiding strategy for my work. This year, I will focus my efforts around helping people realize the benefits of a robust digital platform built around publishing, curating and engaging others with great content. I’ve been thinking about writing a book for years and made several half-hearted attempts. This year, I will strive to distill my ideas into some sort of long-form volume that can be consumed by readers. Whether I product a traditional book or not, the important idea here is to focus on producing some sort of collection of my best ideas and practical experience. 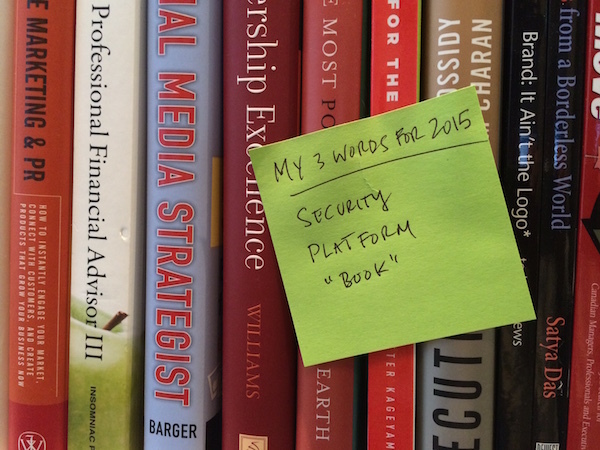 I would love hearing about your 3 words for 2015. Please reach out and share them in the comments below or via an email.